Trucks are made for towing. The bigger the truck, the more it can tow. But sometimes it's not the weight of the load that bogs them down. Sometimes it's the weather. That's what Mark Blessed found this winter when he encountered a tractor-trailer stuck in the snow. The truck was blocking an ambulance (with the patient on board) from passing, so Mark did what any Jeep-driving good samaritan would do and pulled it out of the way. And for his efforts, he was lauded as a hero by the local radio station. The effort was all the more impressive when you consider that Mark's Wrangler is 20 years old, and that the Mercedes rig weighed a good 40 metric tons. And it wasn't the only vehicle he helped get out of the snow that day. The resident of St Austell in the British county of Cornwall was among the award recipients feted this past weekend by local radio station Pirate FM. 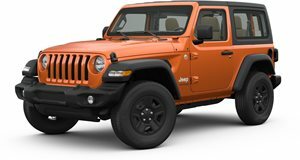 As a token of the public's appreciation, FCA's UK office gave him a package of Jeep-branded gifts, including a new spare-wheel cover for his long-suffering Wrangler.